Connect: An easy-to-use homework and learning management solution, embedding learning science and award-winning adaptive tools to improve student results. 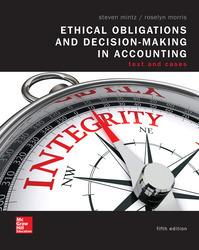 The text helps students cultivate the ethical commitment needed to ensure that their work meets the highest standards of integrity, independence and objectivity. This program provides instructors with flexibility and pedagogical effectiveness and includes numerous features to make learning and teaching easier.